The weekend's shopping finds both have an English influence, and I feel compelled to share them now that we're just weeks away from the next royal wedding! 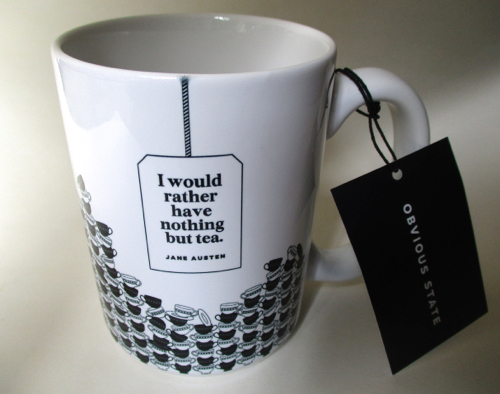 First, there's this lovely commemorative mug by Molly Green that I found at T. J. Maxx for $5.99. 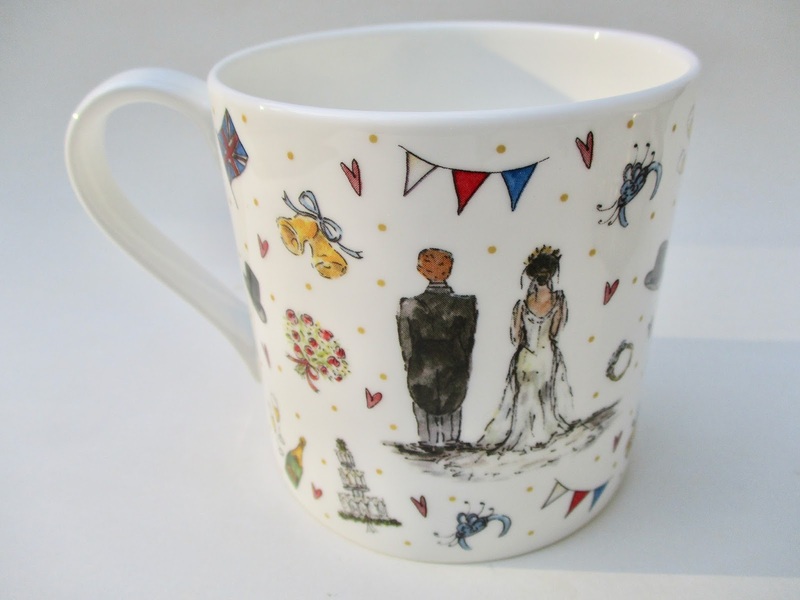 Every tea-loving wedding watcher needs one of these, right? 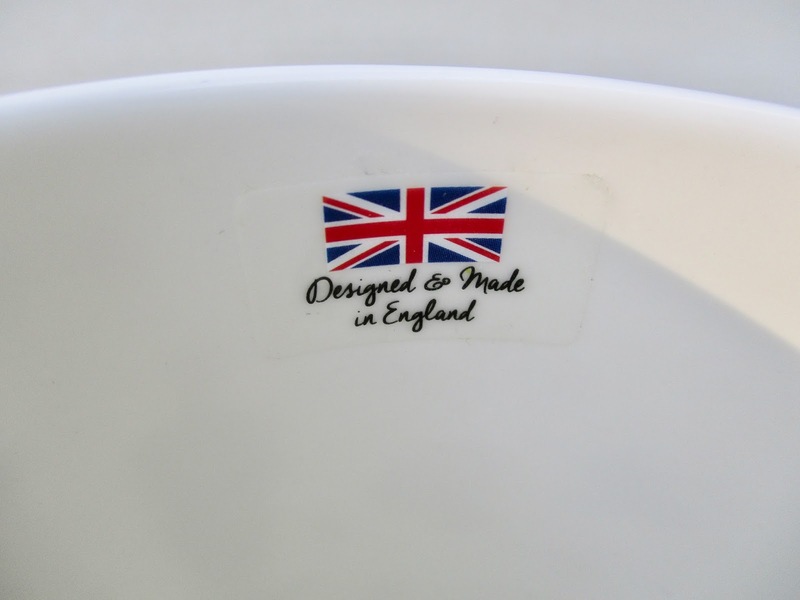 With so many tea wares made in China and merely decorated in England anymore, I was surprised to find this sticker inside the mug reading "Designed & Made in England." Here's the back of the mug, and I'll be interested to see if it bears any resemblance to real life! 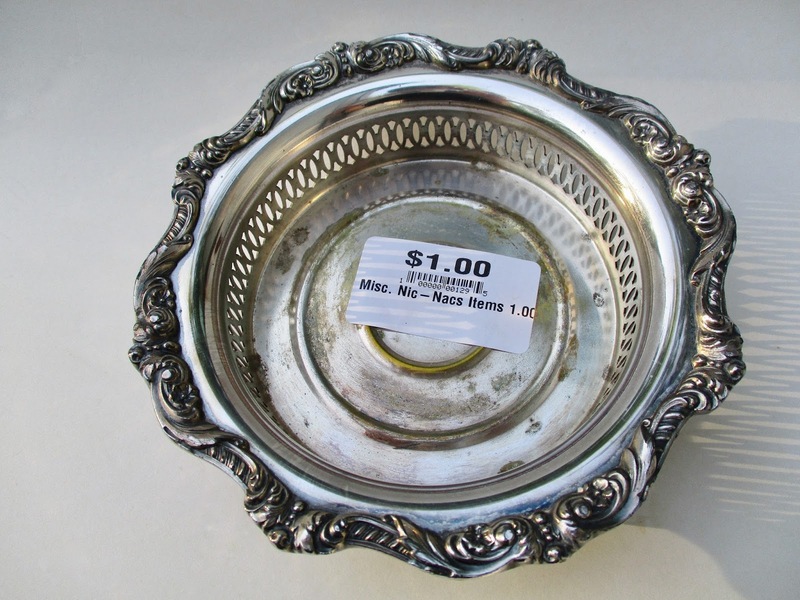 My bargain find for the weekend was an old silverplated dish I found at a new-to-me thrift store in Carrollton, the Blake House Thrift Store (it's near the Publix Shopping Center, if any of you locals are curious). If I had an antique store or a place to resell items, I would have loaded up there! 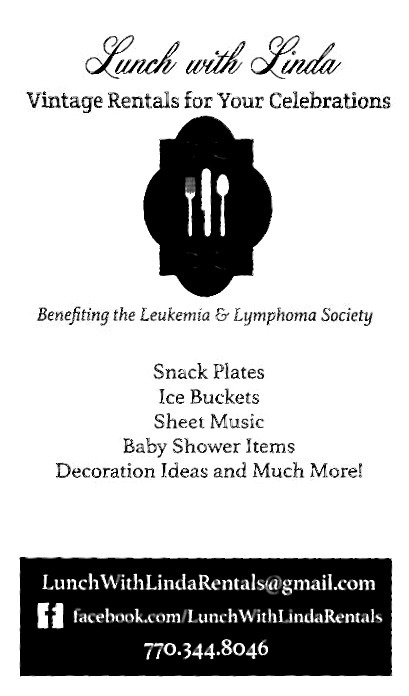 They had beautiful glass-handled tidbit plates, china platters, a few teacups and teapots, and nothing was over about $4. But I'd been searching for a small candy dish, and I love the pierced design on this one. 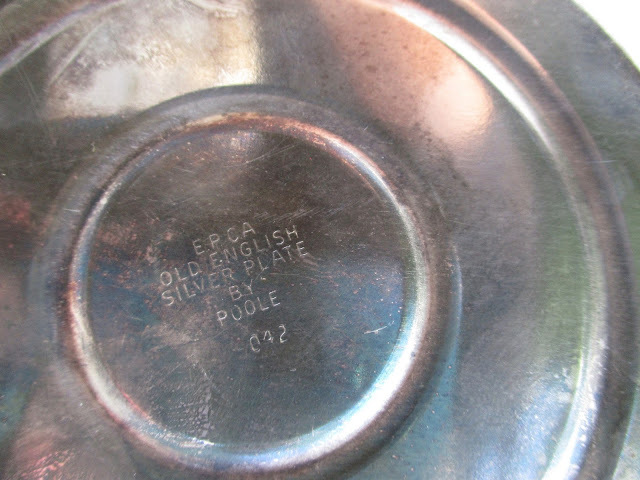 "Old English Silver Plate by Poole," it says, and I've purchased a fresh new container of Wright's Silver Polish so I can pretty it up. I believe Poole was a Massachusetts company, but I can't blame them if they, like me, like all things English! 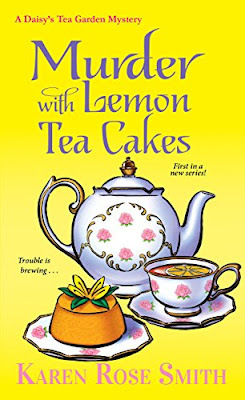 Summary: In this new Daisy's Tea Garden Mystery series from Karen Rose Smith, young widow and mother of two Daisy Swanson runs a tea garden along with her aunt, Iris Albright, in the town of Willow Creek, Pennsylvania. Iris has been seeing a local businessman named Harvey who is close to finalizing his divorce from his gold digger of a wife, but before the divorce is finalized, Harvey is found dead in Daisy and Iris's herb garden. Plenty of folks seem to have had a possible motive for killing Harvey, including some business associates and his almost ex-wife. My thoughts: I enjoyed the scenes in the tea room as well as the interactions with the Amish locals. 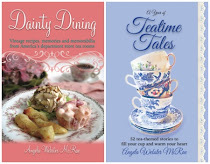 Plus, it's always fun to put myself in the position of "tea room owner," especially since I enjoy reading about female entrepreneurs. I appreciated knowing that one of Daisy's daughters was adopted and the storyline surrounding that. 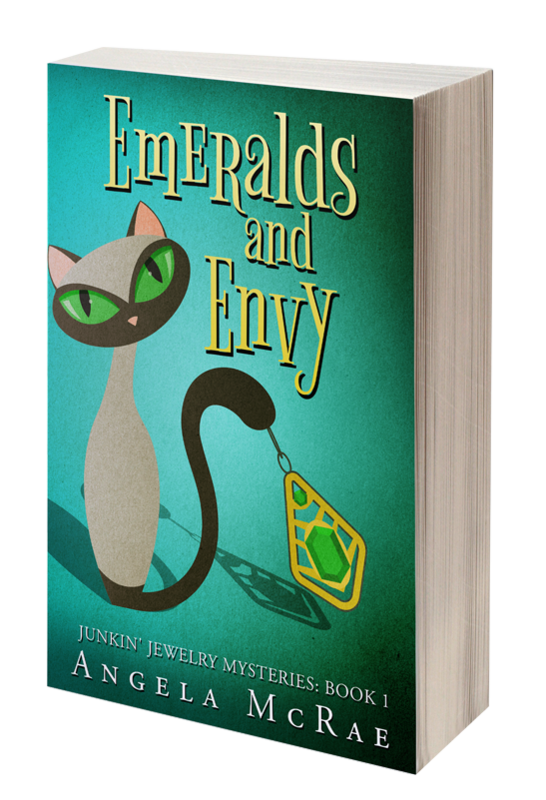 The judgment: I found it interesting that both Daisy and Aunt Iris had to deal with grief, and I pondered the fact that cozy mysteries don't normally make me sad, as this one did. Daisy is still mourning her late husband, Ryan, although she's clearly thinking about moving on with her life. For Iris, the grief is much fresher, and at times, I felt sympathy for both women. For discussion: The "Lemon Tea Cakes" of the title are mentioned quite a few times in this book, and I had a hard time figuring out exactly what they were based on the picture on the cover. That looks like a miniature pound cake of some type. In my neck of the woods, however, a "tea cake" is an old-fashioned, very light and cake-like cookie. When I got to the recipes at the end of the book, I found that the cookie version of "tea cake" is what this author had in mind too. Were you picturing a cake or a cookie as you read? 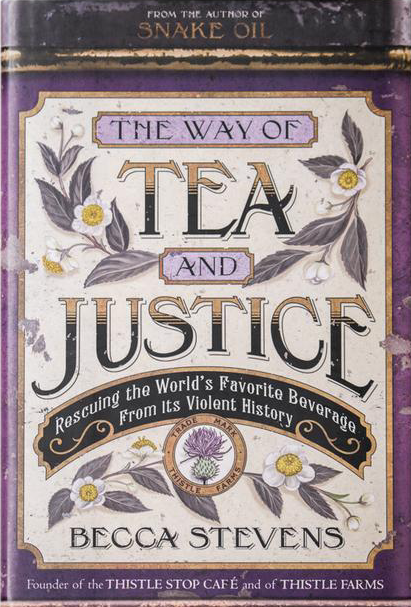 Next Month's Book: I'm ready for some nonfiction again, and a book that I'm intrigued by is "The Way of Tea and Justice: Rescuing the World's Favorite Beverage From its Violent History" by Becca Stevens. Some of you who've been reading this blog for years may remember this little girl. Well, niece Cari turned 19 last week and decided to come here to Newnan for a shopping day. 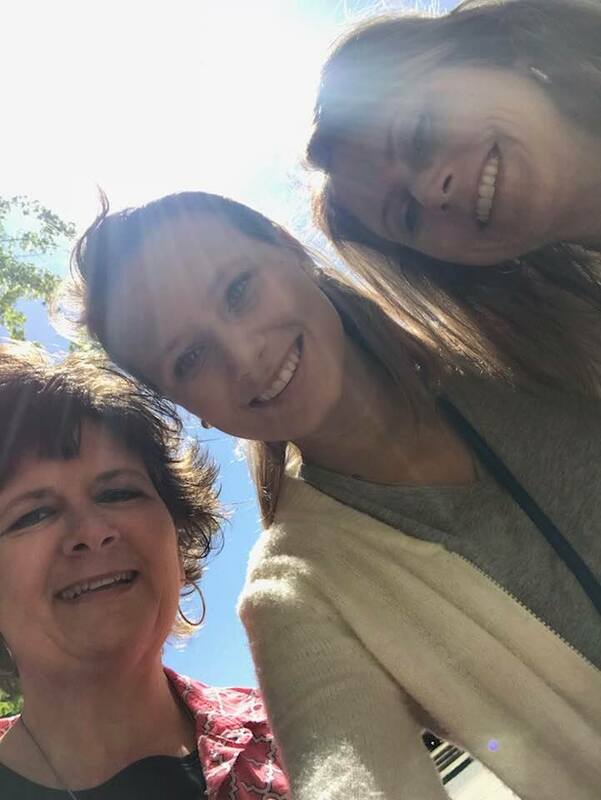 So here are my sister Rhonda, Cari's mom, and myself out at Ashley Park, our "lifestyle center" that gets a lot of out-of-town visitors. 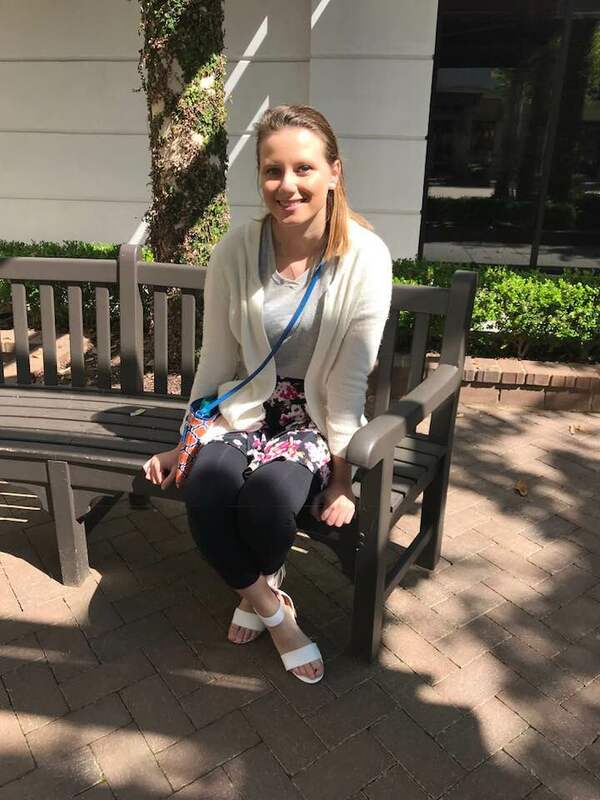 Cari used her birthday money and gift cards to buy the typical 19-year-old's favorite treats: clothes, shoes, and jewelry. She also wanted to go to Charming Charlie, so we did. And my sister immediately spotted this travel mug and turned to me and said, "You need this." My sister isn't one for impulse purchases, but she was right about this. 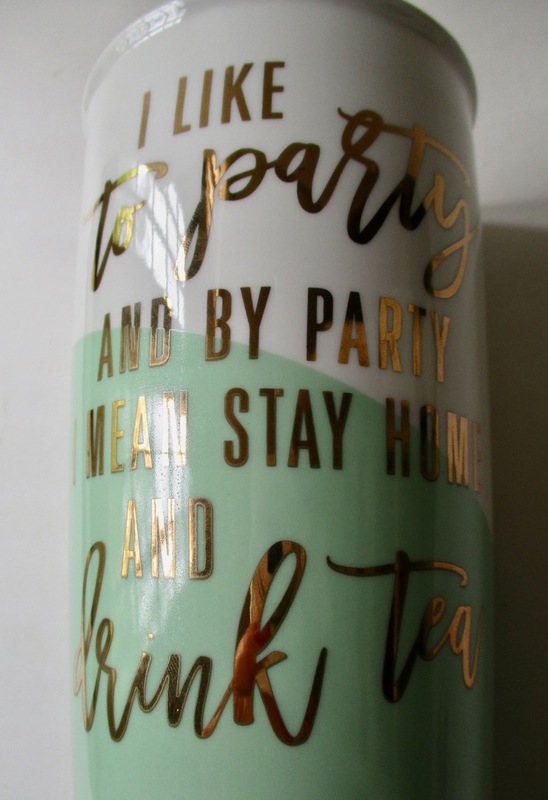 If you're having trouble reading it, it says, "I like to party and by party I mean stay home and drink tea." 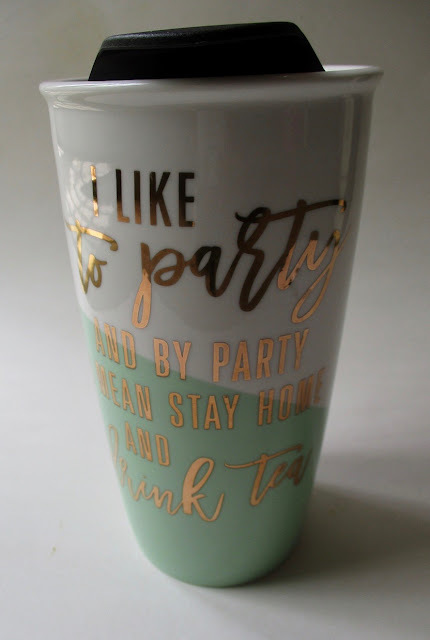 This mug is absolutely perfect for a tea-loving introvert like myself, and it's a fun souvenir of my day helping Cari celebrate turning 19! 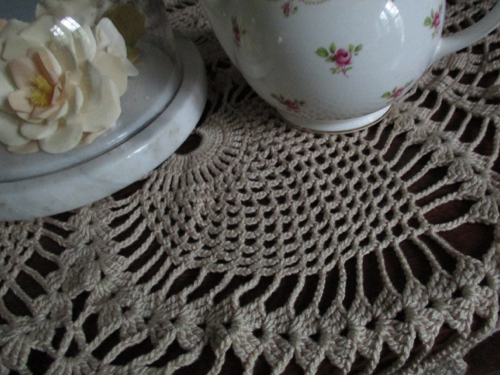 Years ago, I crocheted a large doily out of a pretty lime-green color crochet cotton that I was just wild about at the time. Not surprisingly, I quickly grew tired of that not-so-subtle color, and I would go on to use that doily outdoors, where it suffered the ravages of time and ended up a dirty and very faded shade of green. I couldn't bear to throw it out, though, because it had taken so much time to crochet, so I threw it in the washing machine a few times but eventually just stored it with a pile of old linens. Recently I was going through some of the linens and ran across the old doily. It featured the pineapple design shown here, that sort of fan-shaped motif that women like me have been crocheting for decades. 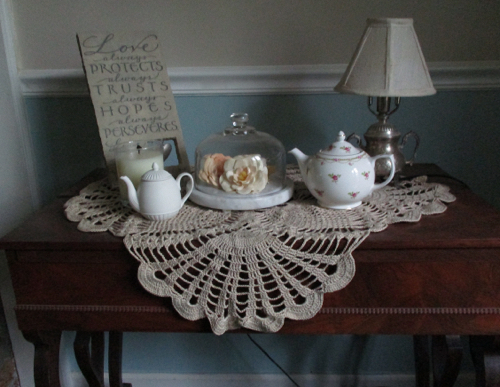 And then it dawned on me: Why not let the doily soak in some tea for a few days? 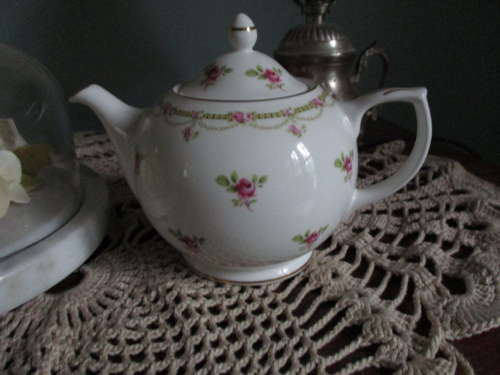 I had some old (loose) tea and boiled it in a pot, the brew stout enough to trot a mouse over, I'm sure, but it did the trick of bringing the doily back to life. 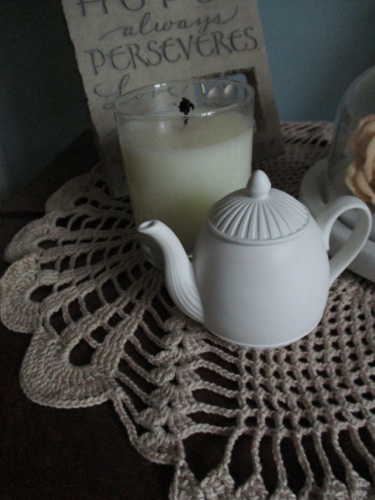 And my tea-dyed doily in the soft cotton thread is now in use once again! So if you've got some old linen piece that's discolored but usable, I thought you might like to know that my tea-dyeing solution worked out quite well for me here. Funny enough, not long after the tea-dyeing episode, I came across this hardback book in Goodwill for a dollar and some change. 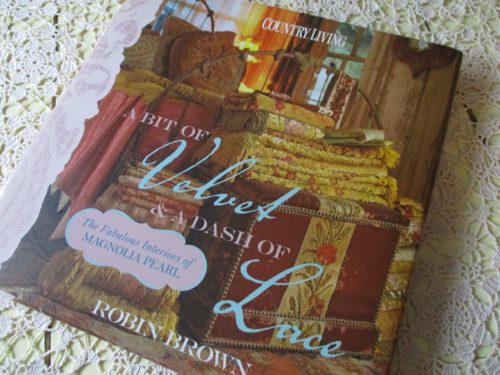 "A Bit of Velvet & A Dash of Lace" by Robin Brown, it's called. Didn't I once own that book? I'm almost sure I did, but it had long since disappeared or been loaned out, so I bought this one. 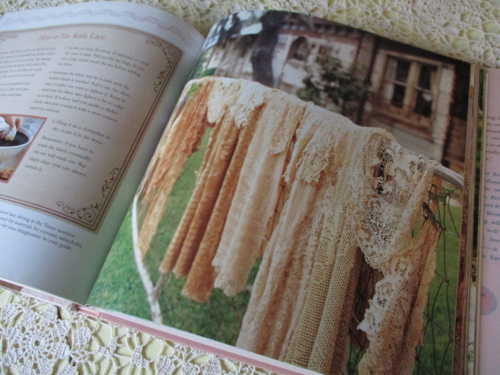 And inside is a lovely feature on "How to Tea Stain Lace." Guess you could say we're on the same page! 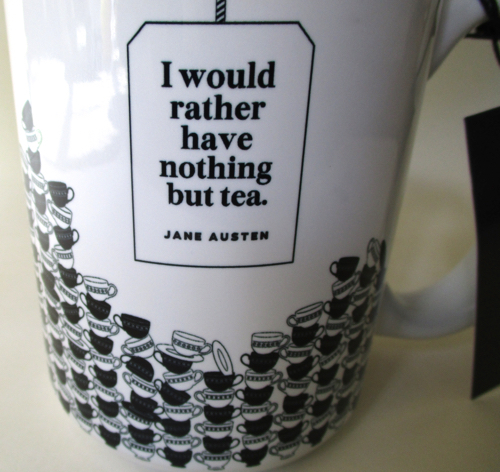 Friends are so generous in sharing tea-themed gifts with me, I often wonder why on earth I am so blessed. And sometimes, a gift comes from a thoroughly unexpected source. Last week, a former coworker I haven't worked with in years texted me to say she had "a little something" for me, and she could either drop it off with one of my clients or I could stop by her office. I was going to be near her office that very week, so I told her I'd stop by. I couldn't imagine what the "little something" might be, even when she handed over a pretty black-and-white bag tied with sheer white ribbon. 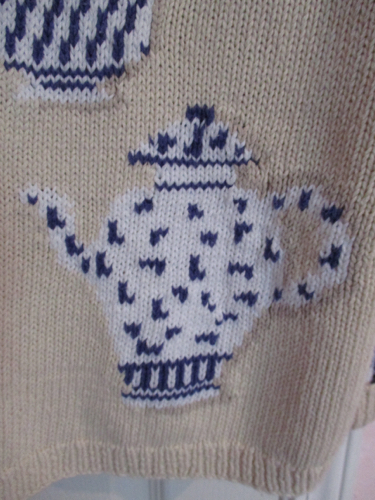 Inside was one of the loveliest, most elaborate teapot ornaments I have ever seen! The beaded metal butterflies are absolutely adorable. 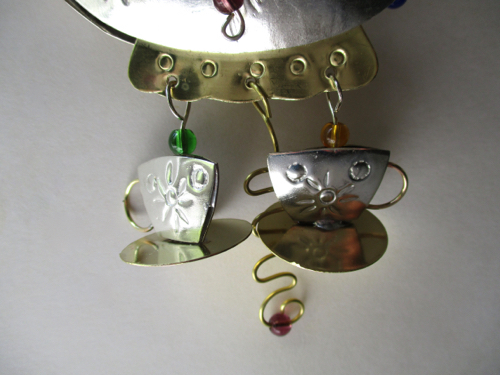 And I was tempted to pop the dangling teacups off to wear as earrings! I haven't yet decided whether I want to hang this on a window or on a cabinet or where, exactly, so that I can most enjoy it, so for now, it's at home on a teacup stand! 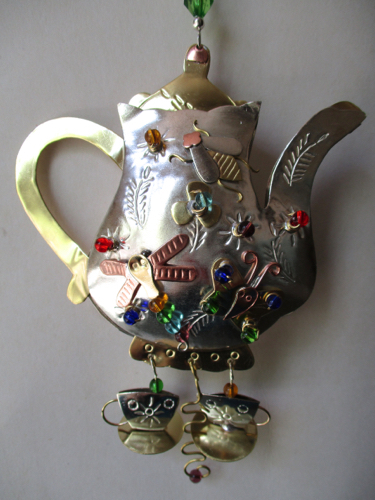 Have you ever seen a metal-crafted teapot like this? 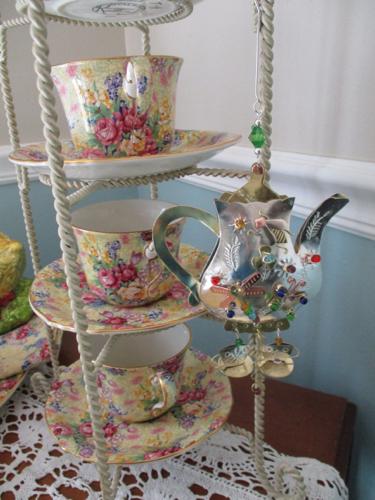 I haven't, and I sure thought I'd seen it all when it comes to teatime ornaments! 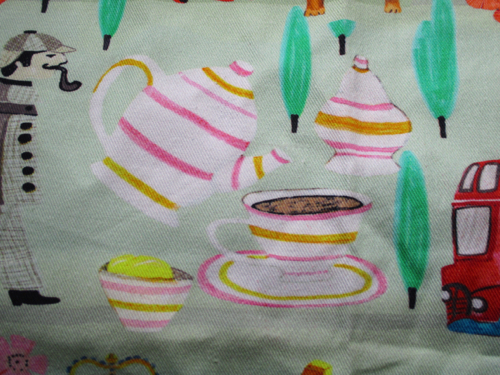 Some of you know that I collect images and recipes and memorabilia from old department store tea rooms. Most of my collection was acquired as I compiled a book on the topic back in 2011. I occasionally get the urge to write a second book, and so I've begun researching again. 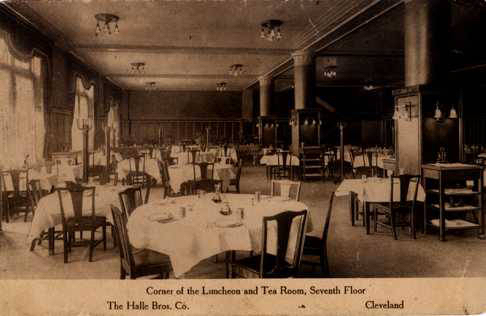 This week, I came across a postcard image I'd never seen before, for the Halle Bros. Co. in Cleveland, Ohio. I'm surprised by how very spacious the tea room looks, especially by today's tea room standards. I know I've asked this before, but it's probably time for me to ask it again: How many of you can ever remember going to a department store tea room? If you did, I'd love to hear the name of it, because it might be one whose history (and recipes) I need to explore! 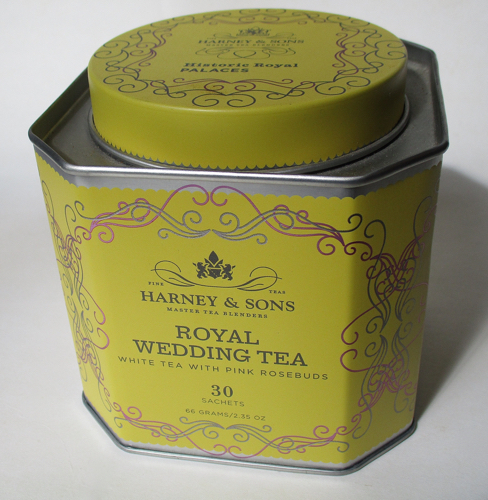 But the real reason I'm writing about Barnes & Noble today is to let you know, if you didn't already, that the Royal Wedding Tea from Harney & Sons is back at B&N. The tea was good, as I recall, but I mainly just wanted a commemorative tin, which I have kept and enjoy decorating with on occasion. I believe it is now priced at only $5 at B&N with the purchase of any other tin of tea. 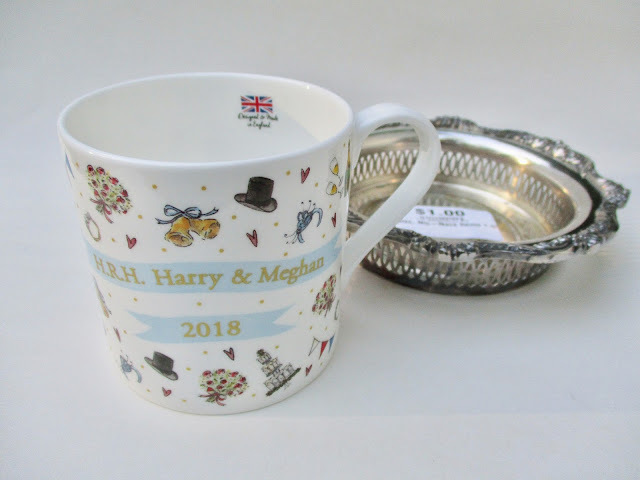 So if you missed it on the occasion of William and Kate's wedding, please do not miss out with Harry and Meghan's! So, I told myself that fifteen years' worth was quite enough Tea Time magazines and that I was going to a) stop collecting them and b) list my old ones on eBay, keeping only the books from Tea Time magazine instead to provide with me some much-needed shelf space for books. Let me just say, "Ha-ha-ha-ha-ha." 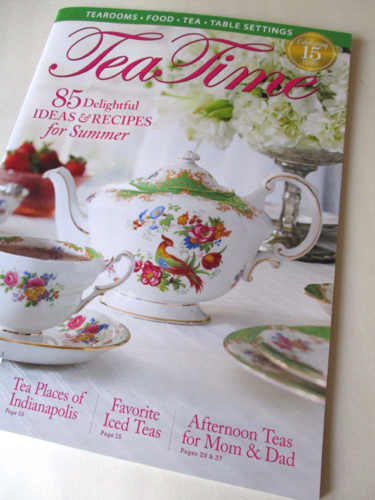 That bright idea lasted about five minutes before a friend on Facebook mentioned a new Tea Time article I hadn't seen because I had decided not to get any more issues. Regretting my delay, I went in search of the March/April issue, which I found, and days later I happened upon the May/June issue as well. And I'm so glad I did. 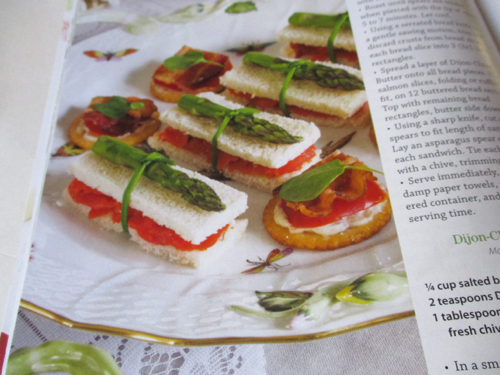 For one thing, I don't believe I've ever before seen a tea sandwich styled quite like this simple, pretty-as-a-package design, and that alone was worth the price of the magazine. I love pretty things, and this is so pretty! The joy of a handmade gift! I don't believe anyone appreciates a handmade gift quite as much as those of us who like to make handmade gifts ourselves. For that reason alone, I was so delighted when Sandy G. sent me this surprise package in the mail last week! You know the package is going to be something you love when it has a teapot on the mailing label and a tea-themed card inside, don't you? 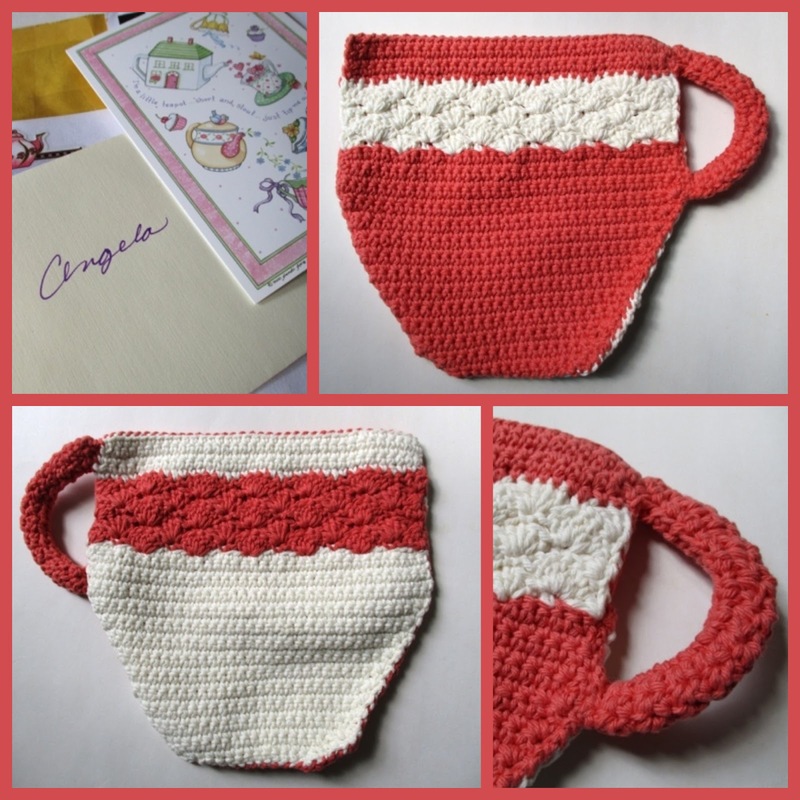 This reversible teacup hot pad is a crochet design I've never seen before (I would have had to make it! ), and I absolutely love it! 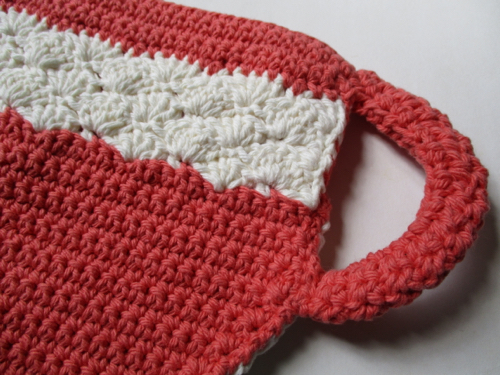 Larger than a potholder, it's large enough to actually use beneath a hot dish on the serving table, but it's so pretty with that lovely stripe of shell crochet that I wouldn't want to cover it up. Can't you practically feel the cozy texture from this photo? 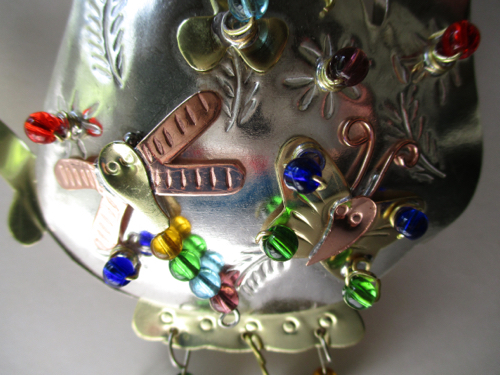 It's such a beautiful and unexpected gift … and it inspires me to go make something to give away myself! Do any of you give handmade gifts? If so, what's the last handmade gift you gave? 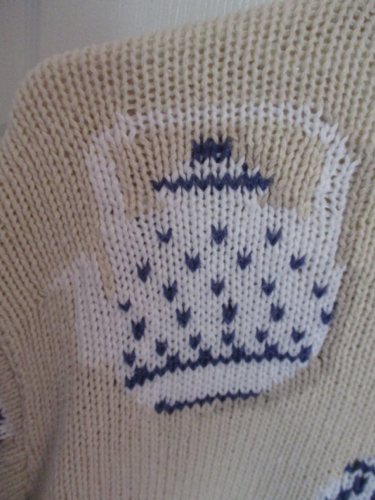 I will, I suppose, always love those sweaters with teapots or teacups on them. I've had a few, but I haven't had this one from Talbots, and when I saw it for $5.99 at a Goodwill store recently, I immediately knew I would be working it into next fall's wardrobe. 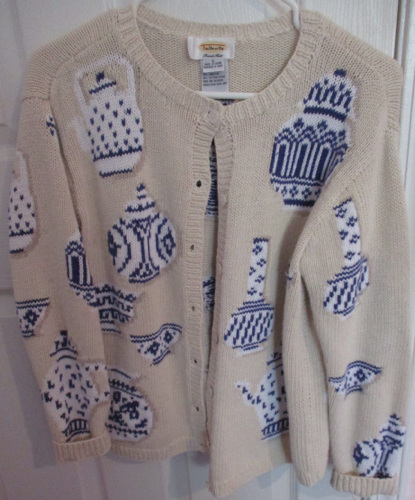 For about a half second, I thought, "But is a sweater like this even in style anymore?" Immediately, my more sensible self answered, "Who cares if it's in style? You like it, and you'll actually wear it, so get it." And so I did. I'm picturing it with jeans and a white or navy three-quarter-sleeve T-shirt, perfect for junking in the fall. But who knows? Maybe I'll find some pretty new navy slacks and dress it up with a blouse and some nice jewelry. Or maybe I'll find a navy dress and wear this to church. The point is, whether it's "fashionable" or not, it's going to be "my" fashion, and here in my almost mid fifties, I'm finally comfortable enough with who I am to not give much thought to whether what I wear has the approval of others. Yet I am still curious where you all stand on fashion, since most of you readers, from what I can gather, range from perhaps the late thirties/early forties to the sixties and seventies. I can't see a forty-something wearing this. A fifty-something, maybe. Sixties and seventies? Depends on the person, I guess. Many years ago, I had the opportunity to hear lifestyle expert Alexandra Stoddard when she was speaking in Atlanta. She wore a gorgeous suit with a colorful, all-over floral print and, if memory services, fuchsia shoes and blue tights. She even commented on her colorful fashion choices, noting that a friend once told her that her clothes made them smile. She thanked them and said she appreciated the compliment but that she would wear such clothes even if others didn't much care for them because they made her happy. I thought that was a lovely way to think about fashion. So I consider that philosophy as I look into my closet and see about a half dozen rose-print dresses, multiple aqua and turquoise knit tops, and simple sweaters that I wear year after year because I like them so much. Do you have a "style" philosophy? Has it changed over the years? Dianne V. in Canada! Congrats, Dianne! While perusing the digital images of the Library of Congress, I've come upon quite a few scenes of women having tea, but I haven't found that many images of men having tea, much less men who happen to be the Secretary of War! Here's the caption on this circa 1918 photo: The Secretary of War, Newton D. Baker inspects Red Cross activities at the American hospital in Dartford, near London. Sunday afternoon "tea" at the hospital is a regular function, not only for the patients, but also for the staff. 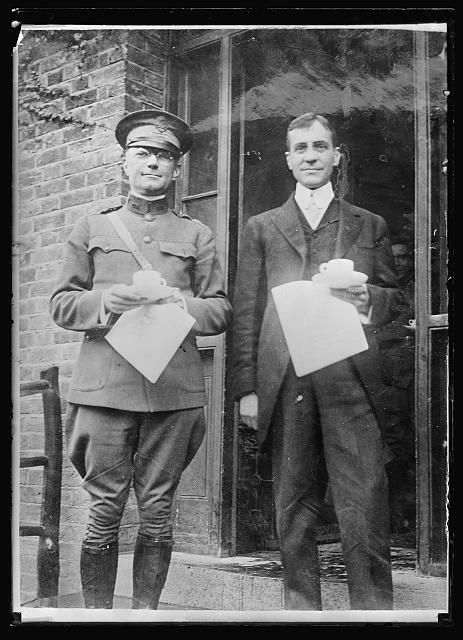 Mr. Baker and the Commanding Officer of the hospital, Major E.H. Fiske of Brooklyn, have their tea on the doorstep of the Administration building. I believe Secretary Baker is on the right and Major Fiske is at left. This image was a gift from the American Red Cross, and I'm grateful they gave photos like this one so that we could all enjoy them and learn from them! 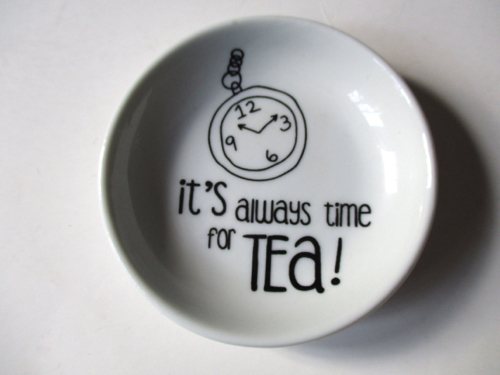 Some great new teatime surprises! Thanks to "Informed Delivery" from the U.S. Postal Service, I now know what to look for in my mailbox each day. Magazines are still a surprise, and largely a joy, but every bill, postcard, card, and letter gets scanned and its image sent to my in-box every morning. Packages, though, are still rare and a surprise. So when I recently received a small Priority Mail box from tea friend Frances in California, I was both surprised and delighted! 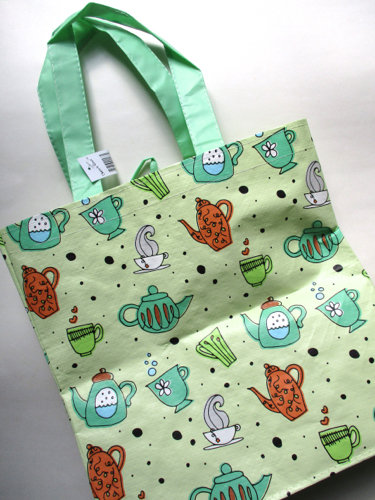 Inside were several wonderful treats, including this reusable teapot-and-teacup shopping bag she found at her local grocery store. Isn't this darling? It's now transporting a quilting project and supplies. And the oven door is now sporting a new tea towel, which Frances tells me came from World Market. 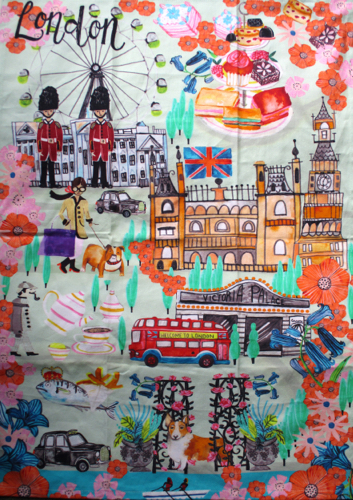 Since I don't have one of those stores in my neck of the woods anymore, I was especially happy to receive this tea towel, which is an absolutely brilliant design for Anglophiles! Here's a detail. It's darling! And last but not least, my package included this new tea bag rest, which also came from World Market. This is also the perfect size for holding one of my cup-size stainless steel tea infuser baskets, and I have been getting lots of use out of this most welcome and most thoughtful gift! So unless you are fortunate enough to have Frances as one of your friends, as I am, you might want to check out World Market (and perhaps even your own grocery store) next time you're out and about! 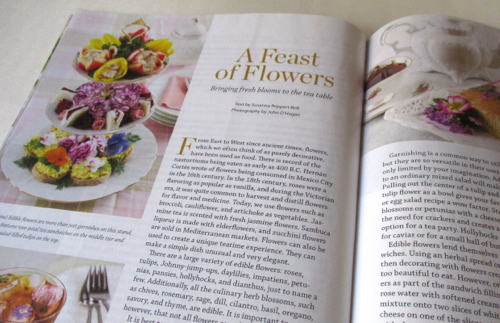 I came across a new special issue from Hoffman Media that I decided would be perfect for the April giveaway! 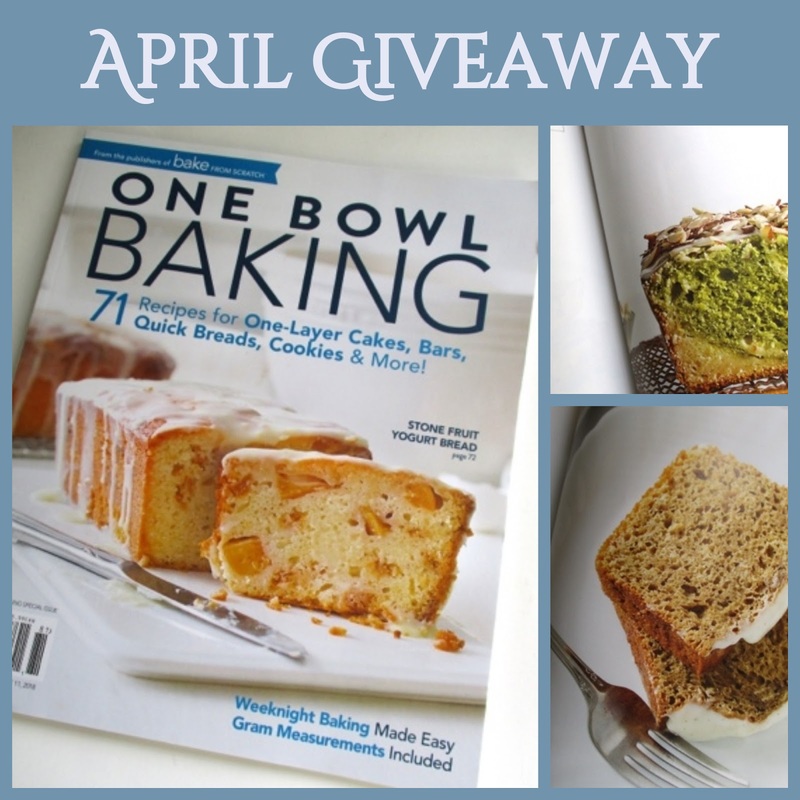 It's called "One Bowl Baking," and it features lots of yummy-looking recipes that would be perfect for springtime. The two pictured to the right of the magazine cover are a Lemon Matcha Tea Loaf and Vanilla Chai-Spiced Mini Loaves, so I'm quite certain this is an issue any tea lover would enjoy. And there are so many tempting treats in this issue: Strawberry Coconut Cake, Kahlua Chocolate Cake with Peanut Butter Mousse, Apple Butter Pull-Apart Loaf, Lime Shortbread Bars, Blood Orange Madeleines … are you drooling yet? If so, just leave an "Enter me" to this post between now and 7 a.m. EST on Friday, April 6, making sure to include an email address so I can contact you if you're the winner, and you'll be entered to win. US and Canada only, please. Good luck!